In December 2013 I presented at a SQL Saturday event in Washington DC. My presentation was about Backup and Recovery Fundamentals which I had done before for the PASS DBA Fundamentals Virtual Chapter. This time around, I decided to add a Tail Log (Active Log) Backup and Recovery demo to enhance my Presentation. The presentation went quite well, and so I’ve decided to put a short video together to demonstrate how to do a Tail Log Backup and Recovery. Today I will be reviewing the product ApexSQL Log which is a tool designed for Transaction Log discovery and recovery. 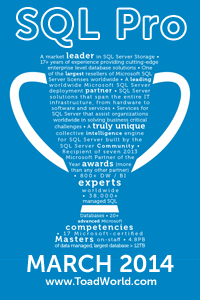 The team at ApexSQL were very friendly and offered me lots of support and help in using the product. I opted to do everything myself just to see how easy it is to learn and use the product. It took me about 30 minutes to get fully acquainted with it; although I’m not an expert now I know my way around the product very well. It’s always great to have a product with an easy to use interface that does not have a steep learning curve.